When you're looking for inspirational college wall decor for your college dorm checklist, our Ride Free Dorm Room Poster is a perfect addition! This dorm wall art item has one of the most inspirational phrases around. Plus, the quote is exactly what you are doing in college! You're going in the direction of your dreams! It's inevitable that there are going to be some tough days in college. You're going to be stressed and possibly even frustrated with certain classes or concepts because maybe you're overwhelmed or maybe you don't fully understand the concept. When you're having a tough time, simply look up at this dorm wall art item to help remind yourself why you're there and doing what you're doing. The inspirational phrase on this college supplies item makes it a perfect wall decoration for dorms to put above your dorm desk. That way when you're trying to get through another huge essay, you can look to this dorm essentials item for inspiration. This dorm necessities item has a neutral sepia tone to make this dorm room decor item blend well with other dorm room decorations. 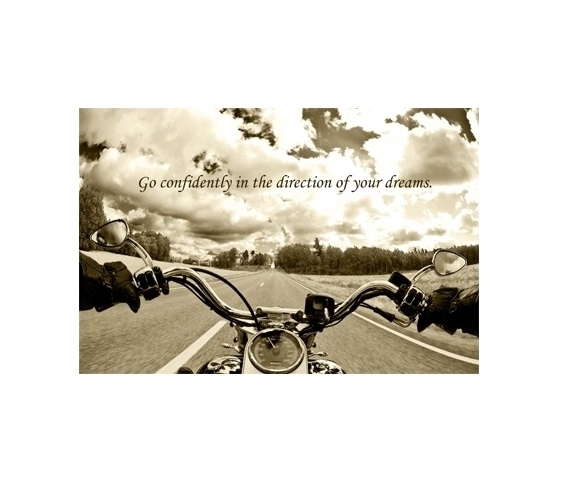 This college supplies dorm product features a motorcyclist driving on a highway with clouds and trees in the backdrop to also add some scenic views to your college wall decor. Make your dorm room decor pop with style and add inspiration to your college dorm room with dorm wall art like our Ride Free College Poster.